SCARP offers planning courses for international students, along with activities around Vancouver and accommodation at UBC residences. Go to the Vancouver Summer Program website for updated details about summer 2019! An article in the Vancouver Sun by Langara instructor Peter Prontzos quotes SCARP's Dr. William Rees' comments about Canada's worsening water crisis. Rees believes the government is shirking their duty to ensure citizens' safety and well being by ignoring our dwindling water supply for the sake of selling oil and hydro electric power. 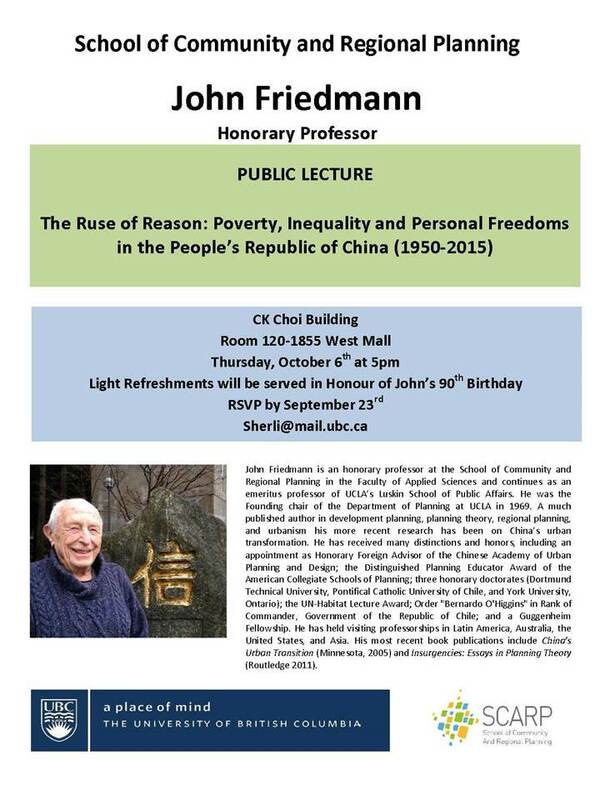 Watch the public lecture by SCARP Honorary Professor, Dr. John Friedmann. Co-sponsored by the Centre for Chinese Research at UBC. On June 9th, SCARP celebrated its 65th Anniversary. The celebration took place at Cecil Green Park House at UBC. The celebration was well attended with about a total of 100 Faculty, staff, students, and alumni. The celebration began with some mingling, door prizes which included 3 books, and the SCARP timeline activity where attendees could add to the timeline if they thought anything was missing from SCARP’s history. Alumni from each decade since 1970s, spoke of their experience at the school as well as where they had gone with their planning degree. Another SCARP success! Planning Canada: A Case Study Approach, a new book edited by SCARP Alumna Ren Thomas, will be launched at the UBC Bookstore on June 17th. Dr. Thomas, a SCARP PhD (2011) and Masters (2007) graduate, is about to start a her new Assistant Professor position at the Dalhousie University School of Planning. The book contains chapters from a number of SCARP faculty, adjunct faculty and former students. This type of book is a first for Canadian planning and it is sure to be widely used in planning programs. Most Westerners misunderstand China’s one-child policy, according to UBC professor emeritus Setty Pendakur, The Vancouver Sun reported. The SALA/SCARP Symposium was held March 9-12 at The Chan Centre, UBC. One attendee said: "I thoroughly enjoyed all the talks, as did everyone I spoke to. The keynotes and papers were collectively powerful, insightful, thought provoking and a testament to the depth and reach of the MUD (Master of Urban Design) program."